When the spring season arrives, it brings with it warm weather and a change in how many cars run. There are some car care tips to keep in mind for the proper care of the car that you can have performed at Road Runner Auto Care in Apple Valley, California. Make sure your car is washed and waxed to remove any salt and other debris that you pick up while driving on roads that have snow and ice on them in the winter. The salt will begin to eat away at the paint if it’s left on the car. Stay safe on the road by checking the tire pressure. Warmer weather can cause the air in the tires to expand, which can mean that the air pressure will increase. If the pressure is too high, it can begin to affect how the car handles and your gas mileage. Road Runner Auto Care can check the pressure for you and look at the tread to ensure that it’s sufficient for driving on hot roads. The wiper blades should be examined to see that they aren’t cracked. The spring season often brings more rain, so you want to make sure the wipers are functioning as they should at all speeds that you turn the wipers on at, such as intermittent or high. 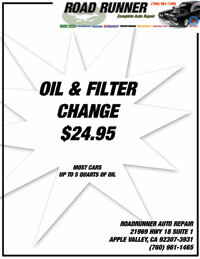 Companies like Road Runner Auto Care can check the fluids and other components under the hood. The belts need to be examined for any cracks that might develop because of the cold weather. Look at the coolant levels along with the oil and transmission fluid. 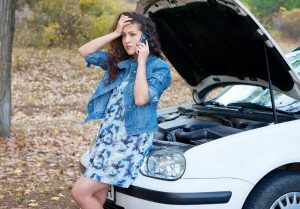 You probably don’t need to run straight antifreeze in the system in the spring and summer, but you want to get it flushed before it turns cold again. Road Runner Auto Care can also check the alignment and suspension to see that it’s tight and straight, preventing you from veering off the road while driving.